Personal Details: Albert was born in Truro on 1897 to parents William and Anne. He went to the public school at Pinnaroo, where he had moved with his parents. He was a tinsmith by trade. He was 5 foot 6 inches tall, with fair complexion, hazel eyes and auburn hair. 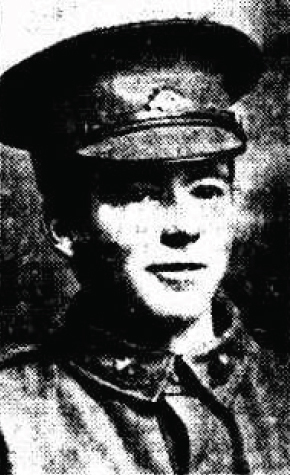 Enlistment Details: Albert enlisted on the 4th June 1915 in Adelaide. He weighed 127 pounds. He was assigned to the 9th Reinforcement of the 10th Battalion. Albert left Adelaide on the 21st of September 1915 aboard the troop ship ‘Star of England’ and arrived at Mudros. At Mudros Albert was taken ‘taken on strength’ on the 25th of November 1915 and trained for conflict at Gallipoli. On the 29th of December Albert was sent to Alexandria in Egypt for further training travelling aboard the troop ship ‘Seeang Bee’. On the 26th of February 1916 he was transferred to the 50th Battalion and was ‘taken on strength’ the next day. Albert continued his training until his Battalion was sent to France on the 5th of June 1916 aboard the ship ‘Arcadian’ arriving in Marseilles on the 12th. Mobbs was sent into battle shortly after and died on the 16th of August 1916 as the battalion was relieved during the Battle of Mouquet Farm. Interesting Material: Albert Lied about his age to enlist. He was only 17 when he signed up. And his dear familiar face. No one on earth like him we’ll find. The loss of him we loved so well.